Ray reveals some ideas of keeping up with the trend without having to splurge on a new wardrobe. Accessories are the key items to create versatile styles! Which of these do you find most handy? 1. Feminine peplum styles has been the trend throughout this year. 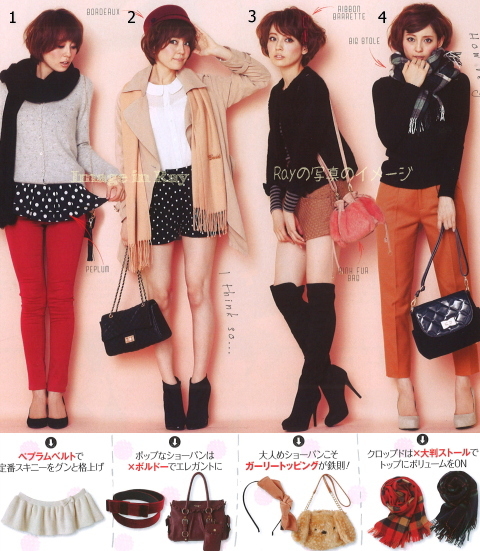 Ray recommends the Japanese way of creating peplum styles with easy add-ons cute peplum belts that look like skirts. 2. Bordeaux color is in. Coordinate your fashion with bordeaux color accessories like hats, belts or bags, the trick for adding a touch of elegance and sweet look. 3. Hair add-ons accessories like bow barrette and hairbands or cute faux fur bags for the sweet girly styles. 4. A must-have accessory, tartan stoles. Stylish and handy, they go well with most occasions.